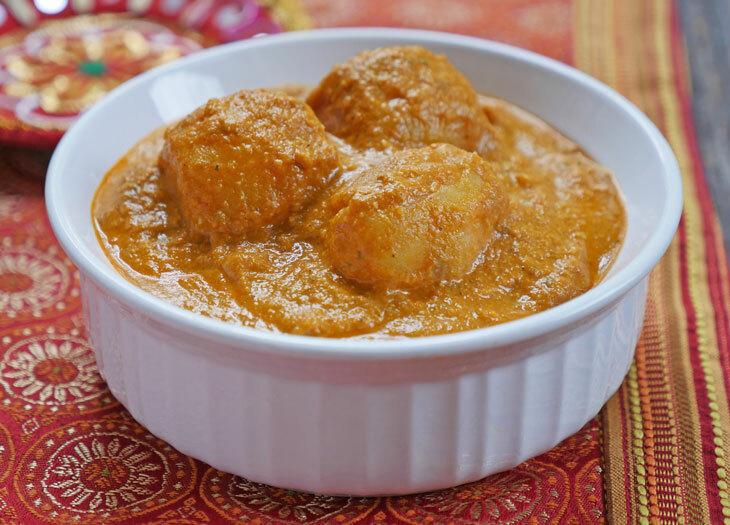 Dum aloo is a popular Kashmiri curry featuring perfectly cooked baby potatoes coated in an aromatic, rich and creamy cashew tomato sauce. It’s a delicious potato curry that’s very easy to make in an instant pot. “Dum” refers to a type of cooking method where food is cooked slowly over low heat in a sealed pot, which helps retain steam which in turn keeps the dish moist. These baby potatoes are cooked over high heat in a short amount of time, so it’s true they aren’t “dum” but the flavor of dum aloo is the same. Prick the potatoes in several places with a fork. Add the onion, garlic, ginger and tomatoes to a blender or food processor and puree until smooth. Set aside. To make the creamy cashew sauce, add the cashews and ½ cup water to the blender and puree until smooth. Set aside. Press the sauté button and add oil and the blended onion and tomato mixture. Stir-fry for 8-10 minutes until the mixture has thickened. Add the spices and the potatoes and mix well, then add ½ cup water to the pot. Secure the lid, close the pressure valve and cook for 8 minutes at high pressure. Open the valve to quick release any remaining pressure. Stir in the cashew sauce, fenugreek leaves and cream if using.